The FLIR E6 has a 45 degree lens with fixed focus which offers the user a clear image over a wide field of view, thus making it suitable for HVAC, electrical and mechanical applications. The 120 x 160 pixel thermal sensor uses infrared technology to measure temperature from -20˚C to 250˚C with a thermal sensitivity of 60mK and accuracy of ±2%. MSX image enhancement uses the integrated digital camera to add additional detail to thermal images and video. Hot and cold spot recognition shows up the temperature extremes on the screen and the camera is capable of saving images to its large internal memory from where they can be downloaded to a PC using a supplied software package and USB cable. 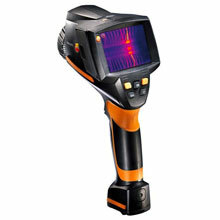 An entry level camera, the Testo 875-1 nevertheless offers excellent thermal imaging capabilities with a thermal resolution of 160 x 120 pixels and a measurement range that stretches from -20˚C to 280˚C. Thermal sensitivity of just 80mK means that temperature variations of just 0.08˚C can be shown on screen. Suitable applications include HVAC, structural and industrial uses. 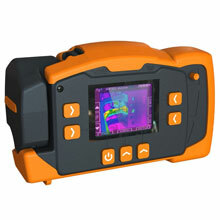 The main selling point of the Testo 875-1 is the point-and-click simplicity to help capture accurate thermal images. The fixed focus sensor provides clarity across the 32˚ field of view and the user only needs to pull the ergonomic trigger to take a detailed thermal image with hot and cold spot recognition. SuperResolution software is provided with the ex-demo Testo 875-1 and this can artificially increase resolution as well as aiding in-depth analysis. As a Cordex product, the TC7000 is certified intrinsically safe, in this case suitable for ATEX hazardous environments in sectors such as oil and gas exploitation, mining and other petrochemical industries. The 320 x 240 pixel thermal sensor does not compromise on detail and the measurement range goes from -20˚C to 600˚C so it is suitable for various forms of fault finding and troubleshooting. The TC7000 is fully compatible with Cordex IR windows and also has a backlit display for use in challenging lighting conditions. Files from the camera can be compiled on a PC for later analysis and the 8GB internal memory has space for thousands of files. The camera has a sturdy design and is the ideal tool for performing thermographic surveys in challenging environments. 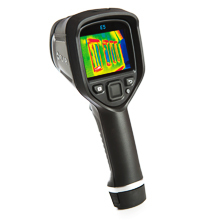 The FLIR E5 continues the ease of use available on FLIR’s latest edition of Thermal cameras. With a 120 x 90 Thermal resolution this camera is versatile enough to be used on a variety of applications. 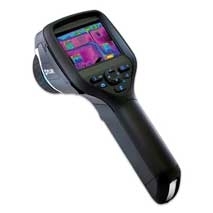 The E5 is extremely sensitive down to < 0.10°C thus granting it the ability to take images suitable for electrical, heating and plumbing inspections. The camera takes Thermal and digital images simultaneously, pairing them within the playback menu. This feature ensures an engineer can quickly reference the exact problematic area in any situation. This intermediate camera is a good choice for an engineer looking for higher quality images and more flexible measurement functions. The FLIR E8 is the highest resolution model available within FLIR’s new E series range of cameras at an impressive 320 x 240 pixels. 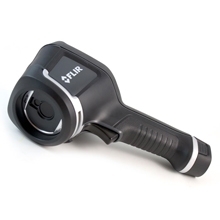 FLIR have retained the simple user interface while offering powerful imaging capabilities and advanced analysis features. Higher resolution and thermal sensitivity down to < 0.06°C provides versatility across a multitude of applications ranging from electrical and HVAC inspections to building surveys. The 45 degree field of view will ensure you are able to capture everything required within your building survey. In addition, the E8 has hot and cold spot recognition modes where areas that fall above or below a user defined temperature threshold are clearly highlighted on the image, particularly useful for alerting to overheating components on electrical circuits and blocked or broken pipes. The FLIR E50bx is a sophisticated thermal imaging camera that can measure surface temperatures from -20˚C to 120˚C and has a thermal resolution from 240 x 180 pixels. It has a 3.5" colour touchscreen which shows thermographs in a range of colour palettes and there are other features such as dew point and insulation alarms, multi spectral dynamic imaging and a thermal sensitivity of 45mK. 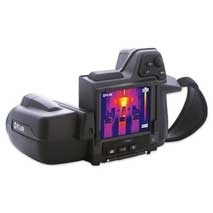 The FLIR E50bx has a large internal memory which can be browsed using the gallery function. Interestingly, it has MeterLink technology which can communicate with FLIR test and measurement meters and there is Wi-Fi connectivity for data transfer to a smartphone or tablet. The FLIR T420 Thermal Imaging Camera has a temperature measurement range of -20˚C to 650˚C with accuracy of ±2% and thermal sensitivity of <45mK. The clear touchscreen has multiple colour palettes and the imager also features an integrated digital camera that enables a range of useful analytical features. Wi-Fi, Bluetooth, and USB connectivity allows the user to transfer data across PCs and smartphones as well as connecting to FLIR test and measurement instruments via FLIR METERLINK® technology.